Launched in 2007, this limited edition timepiece in pink gold (188 pieces) is equipped with FC-935 manufacture-made calibre featuring highly innovative silicon escapement wheel created by Frederique Constant. This famous escapement wheel does not require any lubricating. The use of silicon, an extremely hard compound very resistant to corrosion, is one more sign of the advances and successes made by this young family-owned Swiss watch brand based in Geneva. Frédérique Constant launched its successful Heart Beat Manufacture Calibre in 2004, and since then the brand has been working passionately on the application of a silicium escapment wheel for its Heart Beat Manufacture calibre. The accuracy of a mechanical movement is dependent on the accuracy of the timing device. The timing device for a Frédérique Constant mechanical Heart Beat Calibre is the balance wheel, the balance-spring and the escapement. The balance wheel spins back and forward with a frequency of 4Hz. The period of swing of the balance wheel determines the accuracy. The crucial element in escapement design is to give just enough energy to the balance wheel in order to keep it swinging, and to interfere with the free swinging of the balance wheel as little as is possible. As the lubrication of the escapement ages, friction will increase, and less power will be transferred to the balance wheel. The escapement must keep the balance-spring winding and unwinding. For most of watchmaking history, these requirements have involved considerable friction in the escapement. The teeth of the escapement wheel are powered by the main spring power source, and they actually slide against the ratchet teeth before they lock; this is the friction which kicks the anchor but which requires lubrication. In a modern escapement, the teeth of the ratchet are made of very hard and very polished stone, but lubrication is still essential. The ticking sound of a Frédérique Constant watch is the sound of the balance-spring gear and escapement teeth locking into with each other. If the lubrication fails (through age-related thinning or drying) then the escapement can suffer damage and metal parts will require replacement. The increased reliability of modern watches is due primarily to the higher quality oils used to lubricate the escapement. Typically, a mechanical calibre needs to be cleaned and re-oiled every four years. 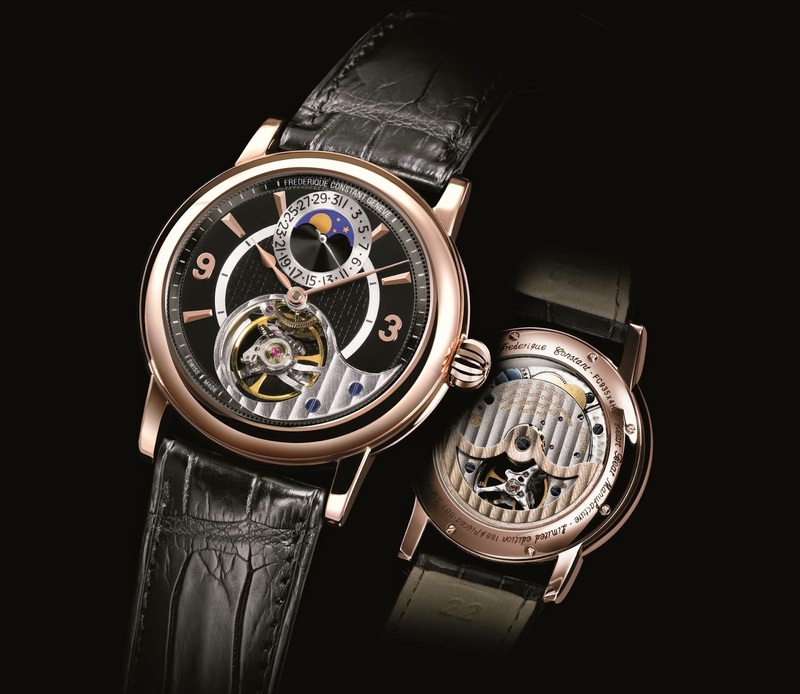 In 2001, Frédérique Constant began the development of its first manufacture calibre in cooperation with the École d’Horlogerie de Genève, École d’Ingenieurs de Genève and the Horloge Vakschool Zadkine. The manual version of the Heart Beat Manufacture calibre collection was introduced after three years in 2004. Since 2004, Frédérique Constant has introduced a new version every year. In 2005, a moonphase and date complication was added to the manual version of the calibre. In 2006, the first automatic Heart Beat Manufacture was introduced. In line with watch industry developments, Frédérique Constant researched the application of new materials for its Heart Beat Manufacturecalibres. Obviously, a major improvement would be an escapement that does not require regular lubrication. In 2007, Frédérique Constant introduced a limited edition series that incorporates a silicium escapement wheel that will no longer need lubrication. Silicium is the ideal material for use in watch making as it is not magnetic, is extremely hard (1100 Vickers compared to 700 Vickers for steel), and is highly resistant to corrosion. The biggest advantage of a silicium escapement wheel is that it does not need to be lubricated. As it does not need to be lubricated, previously mentioned disadvantages such as age-related thinning and drying of lubrication will no longer occur. Silicium is the chemical element in the periodic table that has the symbol Si and atomic number 14. A tetravalent metalloid, Silicium is less reactive than its chemical analog carbon. It does not occur free in nature. It mainly occurs in minerals consisting of (practically) pure Silicium dioxide in different crystalline forms (quartz, chalcedony, opal) and as silicates (various minerals containing Silicium, oxygen and one or another metal), for example feldspar. Silicium is the principal component of most semiconductor devices and, in the form of silica and silicates, in glass, cement, and ceramics. Silicium is widely used in semiconductors because it remains a semiconductor at higher temperatures than the semiconductor Germanium and because its native oxide is easily grown in a furnace and forms a better semiconductor/dielectric interface than almost all other material combinations. In its crystalline form, Silicium has a dark gray color and a metallic luster. It is similar to glass in that it is rather strong. Pure Silicium has a negative temperature coefficient of resistance, since the number of free charge carriers increases with temperature. The crafting of silicium escapement wheels requires a new technology called Deep Reactive Ion Etching (DRIE). A multiple image of the escapement wheels is produced and projected onto a round silicium wafer measuring 100 mm in diameter by 0.5 mm in thickness. Typically, wafers are made in various sizes ranging from 1 inch (25.4 mm) to 11.8 inches (300 mm), and thickness of the order of 0.5 mm. Generally, they are cut from a boule of semiconductor using a diamond saw or diamond wire, then polished on one or both faces. Using a 100 mm wafer, approximately 250 wheels can be produced. The wafer is composed of three different substrates or layers of silicium. The central substrate functions as a separation layer. After the image of the escapement wheels has been projected on the wafer, the exposed lacquered substrate is cleaned away, leaving the non-exposed parts on the wafer. Then, the non-exposed lacquered substrate is etched with plasma down to the separation layer. 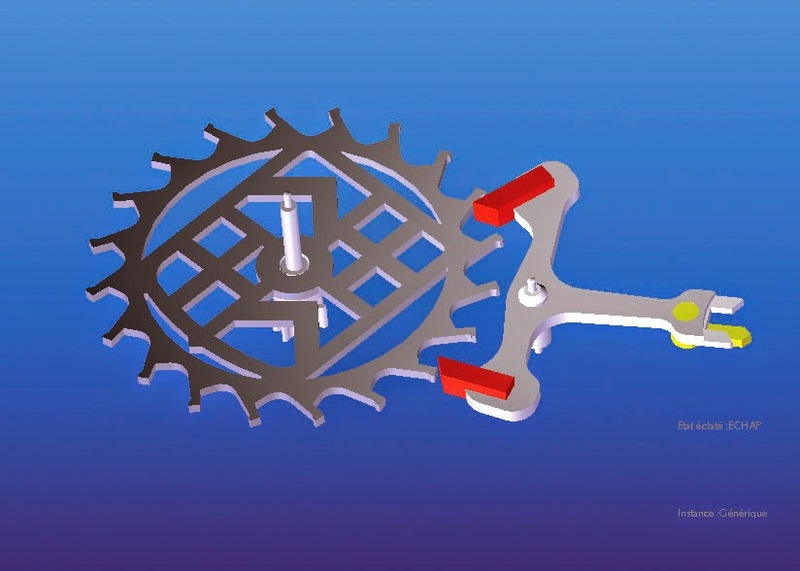 The silicium escapement wheels are thereafter released by isotropic etching. The pieces that come out of this operation have only to be cleaned on the surface. They are all identical and do not need balancing, centring or polishing. Wafers are thus of key importance in the fabrication of the Frédérique Constant silicium escapement wheels.